This post is sponsored by Calico. I love sewing things for my home. I’m also adding more color and pattern to my home these days. As I try to say all of the time, add pattern and color with accessories and when you want to change up a room, it will be much less expensive. Changing pillows and throws is much cheaper than replacing furniture. 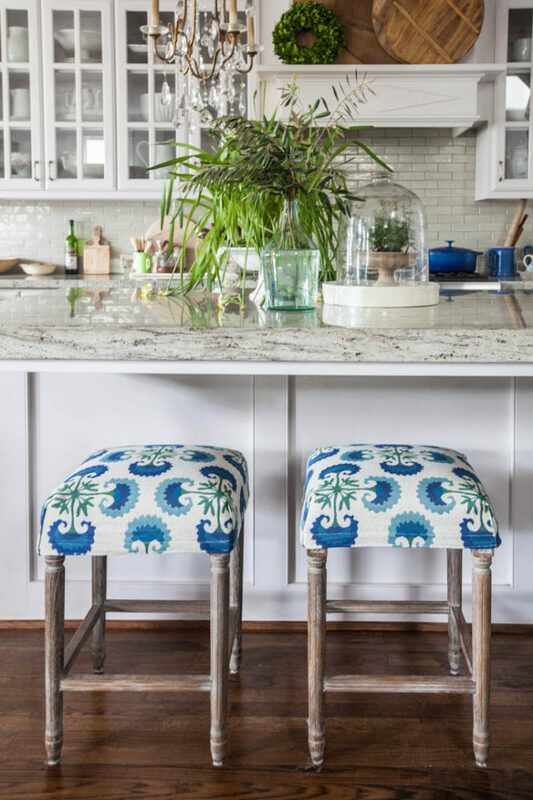 This project is one that gives our counter stools a new look with slipcovers that can be changed when we want. You can see the before and after below. The slipcover is easily removed. 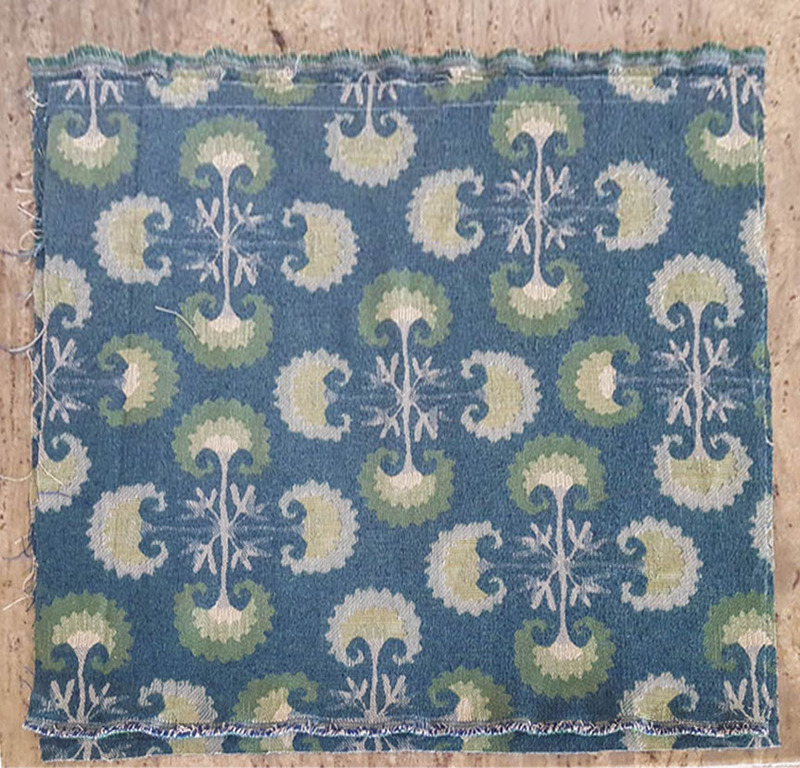 This fabric is Justina Blakeney’s Suz in Indigo, CLICK HERE. The fabric is liquid and stain resistant so it’s perfect for the kitchen. We know a lot of people want to know what the trends are, so today on the podcast we’re sharing what trends are out for 2018. Some of the things in my house are ‘out’, but honestly I don’t care. I’m keeping everything, and I suggest you keep everything you like, even if it’s no longer on trend. If you want to know what’s on it’s way out, take a listen. The thing to keep in mind when you are working with patterns is thatyou now have to make sure the pattern makes sense for your project. 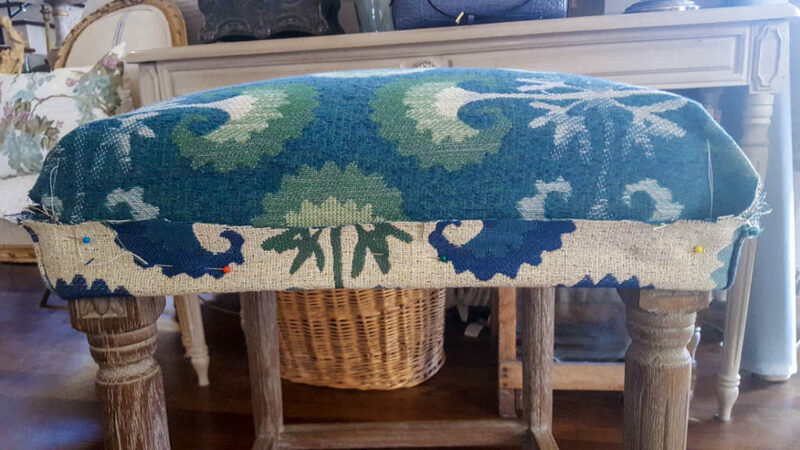 Sometimes you have to match the fabric, like in the ottoman project CLICK HERE. 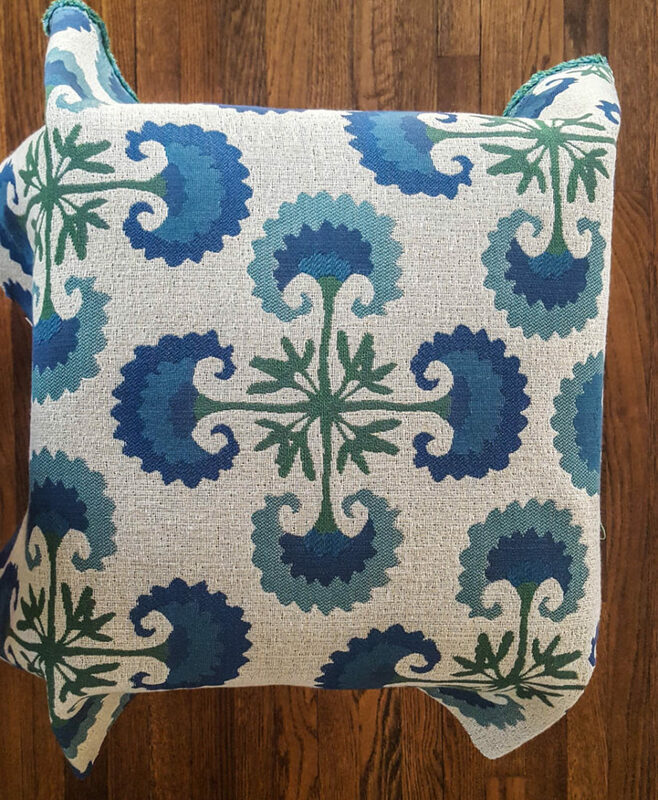 For this project, I thought the pattern should be centered on the ottoman. I cut each cover so that one of the designs would be in the center of the seat. Below, I am showing the two pieces I cut from the wrong side. I always mark where I will cut on the back side. Since I rarely use patterns, I almost always mark my fabric. The back side is where I mark the fabric so it won’t show. 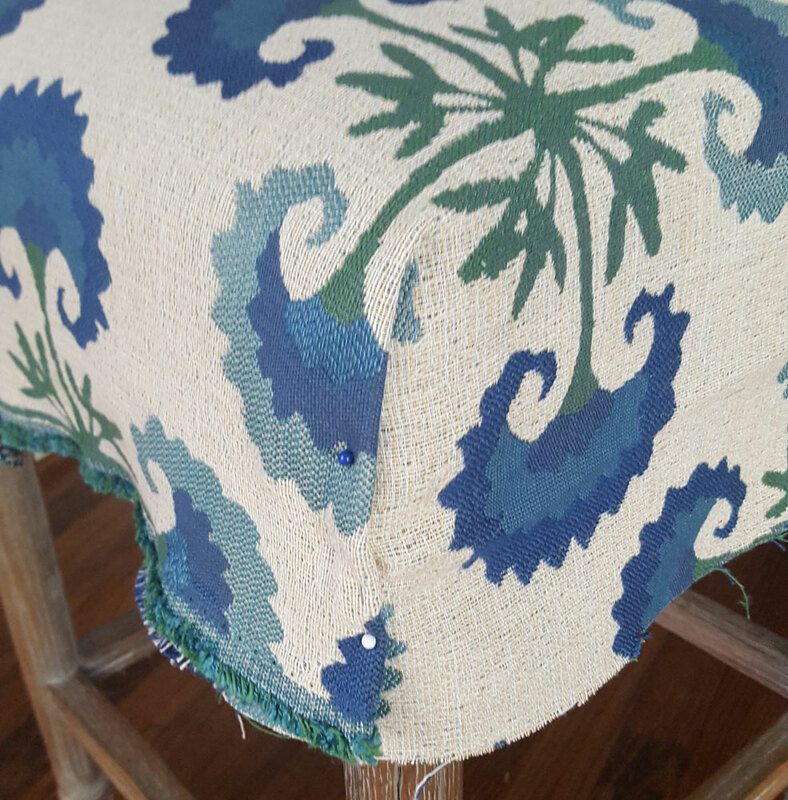 You can see how I placed the fabric on the stool with the pattern in the middle. Normally when I make slipcovers, I pin them from the wrong side, but this design makes sense for a seam on the right side. I pinned all for corners, then sewed them in place. The fabric is bulky, so I trimmed the corners. I did this on the back side or wrong side. Then while the slipcover was on the stool wrong side up, I folded the fabric up for the hem. Normally, I would fold the fabric over twice, but with bulky fabric like this, I only fold once. You can do a stitch along the edge so it won’t unravel when washed. And that was it. I went with a snug fit, which is my preference. I used less than 2 yards of fabric for this project. I like that it added a bit of color to the corner of my kitchen. I don’t normally show this angle of my kitchen. The stools sit behind my sink, actually more in the breakfast room than the kitchen. Perfectly timed post, guess what I’m doing today? 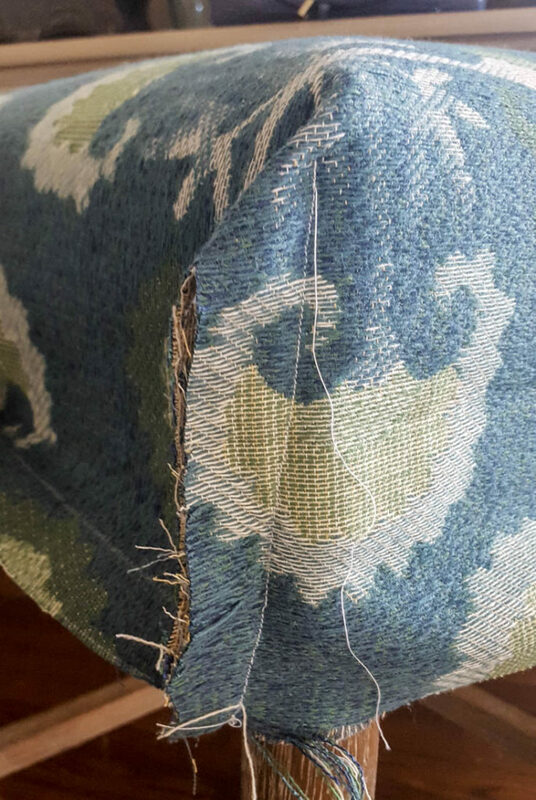 Sewing slipcovers for kitchen chair seats! The seats on my chairs slope exactly like your stool seats, and I was wondering what to do on the corners, now I know how to do it. Thanks! Your covers look great, love the fabric. What? That’s amazing timing. Have fun!!! Aww, I’m so glad it made you smile. The stools look great. I like how they just “slip off” to change out….not stapled down. They add a nice “pop” for your blue & white dishes….that always catches my eye at any flea or antique show. I bought a used copy of your decorating book. Good reading. Yay you found my book! And I’m glad you like the new covers. Yup, they just slide off for cleaning or to change out the look. Thanks Mary. And it was a fun project. They are beautiful and the pop of blue looks great! Those are beautiful. You are so talented! 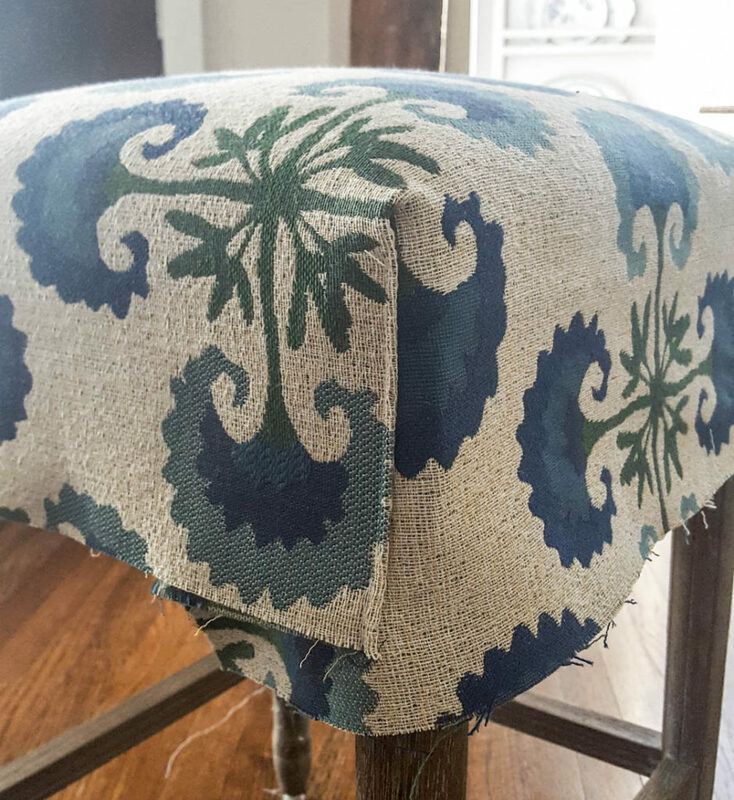 The fabric is amazing with the pattern in the center of each seat being perfect. I too like that the covers are not stapled to the bottom of the seats. And finally, not lost in my line of vision in the first photo, is the bright blue Le Cruset cooking vessel. I’m sure that wasn’t by accident. Thanks for a most informative post. 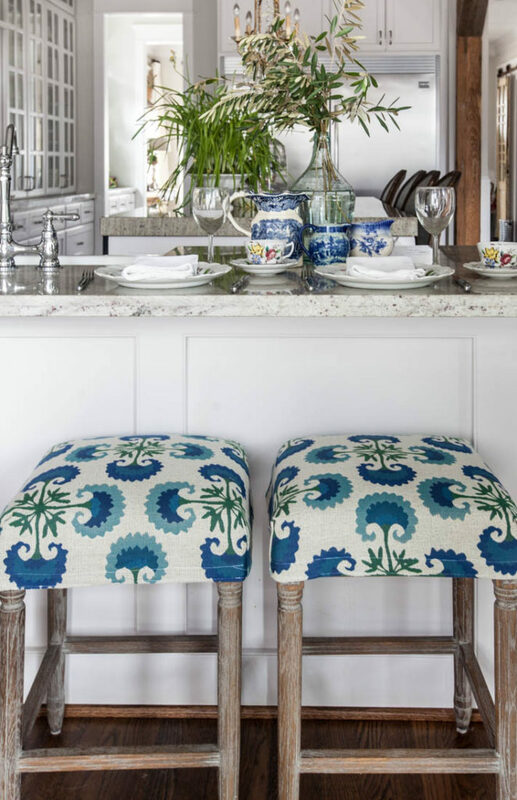 Love those stools and how they turned out with the new slipcovers. Wondering where you purchased the stools? Slipcovers are always a great idea for an easy update. 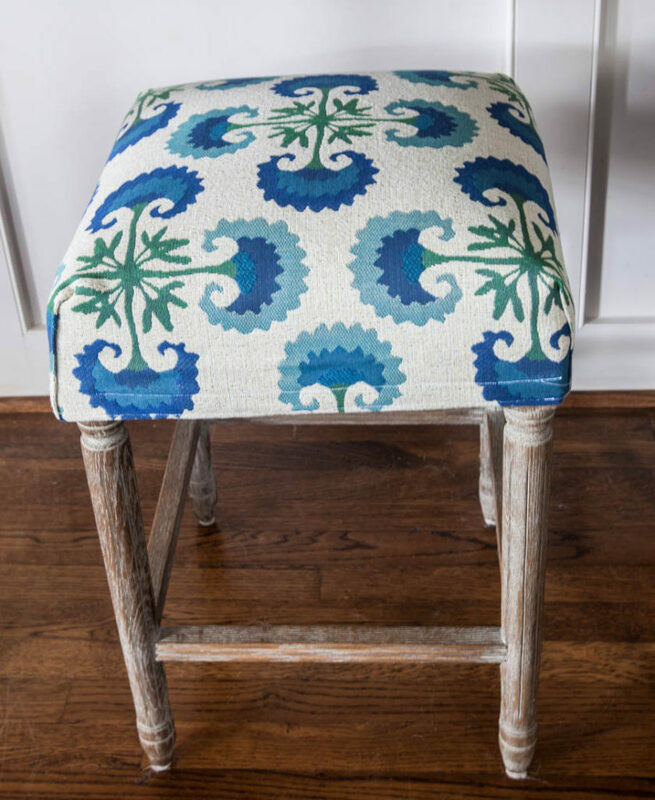 I love the fabric you chose for your stools. They add such a fun pop of color to your decor. Beautiful fabric choice! Looks amazing. Great tutorial, too, for those of us who are sewing-impaired. Thanks Audra. I think this one is pretty simple. Anita, Thanks for the tips! Small changes can make a big difference. While admiring the slipcovers on the stools I noticed your countertop. Is it by any chance a granite called Glacier?? Anita, what a beautiful kitchen! The stool covers make the perfect compliment. Thanks for the tutorial. I think I will give mine a redo! But couldn’t stop looking at the counter top, subway tile and paint color. Beautiful combination. Would you be willing to share the product names you selected? I love the idea of a slipcover to take on/off. 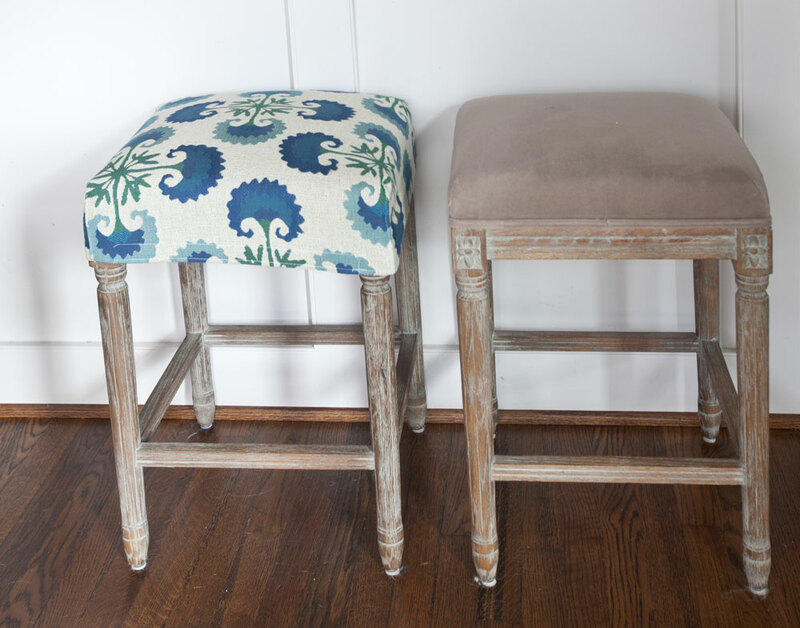 I have seriously just been thinking about covering and adding padding to my barstools. They are round seats. I’m wondering how to make a slip cover for them. Otherwise I’ll just staple or glue them on. Any ideas? You can make slipcovers or do the staple glue thing, whichever you prefer. The slip covers are super cute but how do you keep them from slipping off when people actually sit (slide on and off) the stools? In my house, everything has to serve the intended purpose or I won’t be satisfied. The LOOK great but do they function well without having to constantly fiddle with (straighten) them? Pennie, they don’t slide off since they are snug. Sometimes they shift, but that doesn’t bother me. I am working on a plan for my saddle stools. My fabric is much more lightweight than yours so I believe it will shift too much. I like that the corners are sewn. I really didn’t want to staple. Any thoughts? Jill, these are not stapled on. They fit snuggly. I hope that helps.